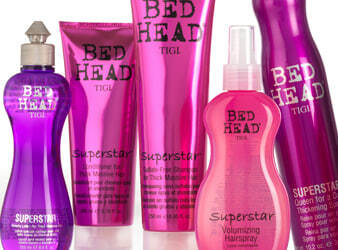 Max your hair withTIGI Bed Head Superstar. Become a Superstar with a range designed to add volume and glamour producing astounding locks that are fit for the celeb lifestyle. The Superstar shampoo and conditioner have been devised to be sulphate-free, meaning that they cleanse hair without stripping the colour and drying the hair. Proteins and rich oils help to feed the hair, leaving it stronger and glossier after use. The shampoo and conditioner has a strawberry yogurt scent that smells good enough to eat!